...when Guy suddenly became interested in doing today's craft. He, of course, put his own little spin on our Merry Mice. ...and his friend "war mouse". I've mentioned his penchant for building robots, but you should also know that he builds robot armies. Why, you may ask? He says, "So the robots can defend our family." Heartwarming. Now we have the beginnings of a mouse army to get our backs as well. I'm feeling very safe this Christmas. 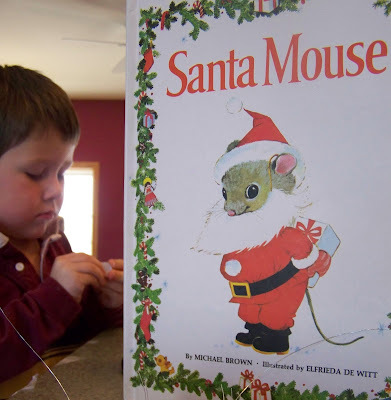 We read Santa Mouse today (a gift from my SIL Somer). The star of our story is a sweet little mouse with quite an imagination and a big heart to match. When he decides to give Santa a special present, he finds himself on the adventure of a lifetime. The illustrations are priceless. The rhyming is perfect. I'm so glad that Somer introduced us to this precious book. I think we will have to leave a piece of cheese under our tree this year, as well. for tonight's Christmas party at church. You can find the recipe at the Tasty Kitchen. It's so easy and so wow! And you probably already have all of the ingredients...just go get some limes and you're all set. Steve made the "limonada" in the background. Find the recipe he used here. That cake looks soooo good. I love limes! So cute! I love the big eye. I'm glad you liked the book. Jos the nativity scene came out great and the baby Jesus was so cute. I am going to develope the phootos tomorrow. I'll send you a copy. Also the girls wanted to make your little mouse but I did not have the egg foam. So that will be done on their next visit and they want to make felt handbags for church. We will do those on their next visit with Nana. Thanks for the idea...they wrapped all of their creations in a box to give as their Christmas to their Mom & Dad. Love you. Hugs to your loving family.